My son’s birthday is April Fools’ Day … which REALLY steps up the creativity needed for the birthday snacks that we bring to school. 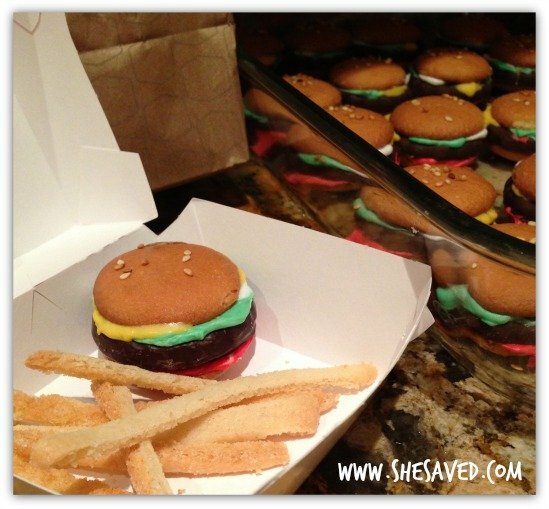 I saw this idea for these hamburger cookies in magazine and we have tweaked and perfected them over the years. 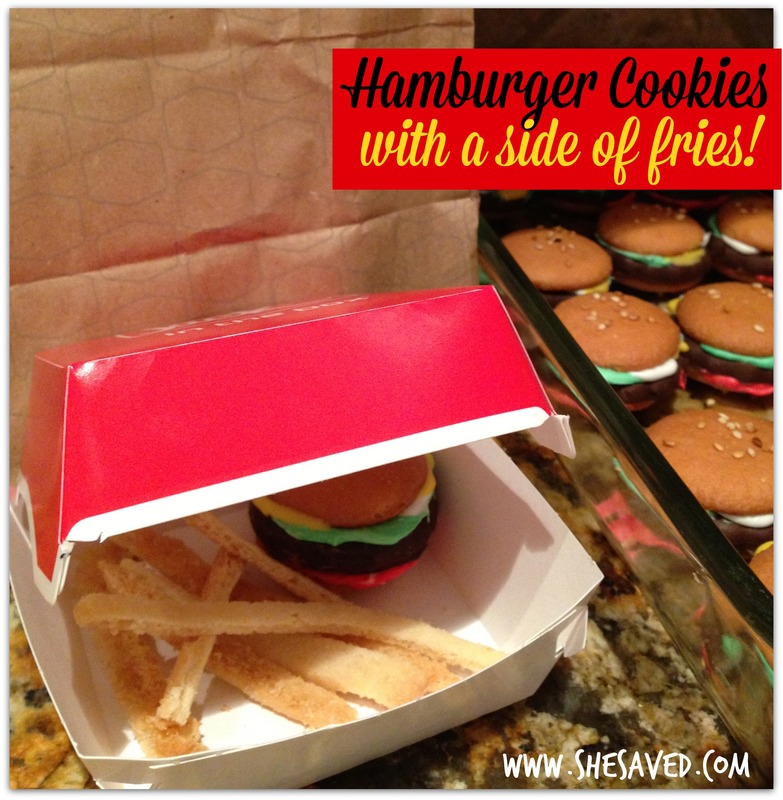 This year we added the sugar cookie fries for a fun touch. AND I also stopped into a Jack in the Box where they allowed me to purchase 25 tiny hamburger boxes so that we could pass out a REAL hamburger meal to each kid in my son’s class. *I actually used melted yellow chocolate for the yellow, so that is definitely an option as well. 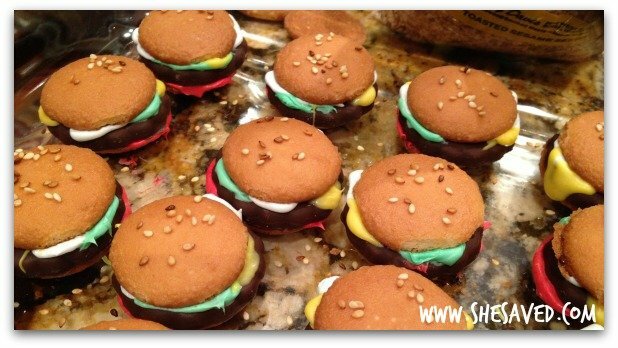 Line all of your hamburger bun bottoms (Nilla wafer) along the bottom of a cookie sheet or pan. I started by putting on the “ketchup”. To do this, dab the red frosting across the bottom cookie. You can’t have to use a lot, but enough to where your chocolate cookie will stick. 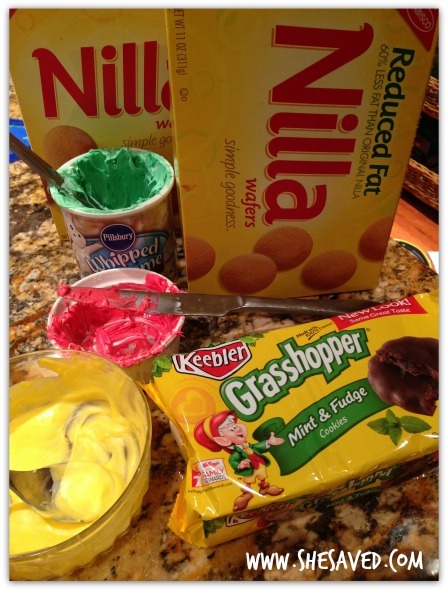 Once the chocolate cookie is down, you can add your “mustard, mayo and lettuce” (your green, yellow and white frosting) I just dabbed these at the edges so that they would drip down and I put enough frosting in the middle to make the lid stick. For the top of the buns, I dabbed each hamburger with water and then sprinkled sesame seeds on top. It’s a cute touch but I went pretty light on the seeds as they probably won’t improve the taste any. I used store bought refrigerated dough for the fries. This process was a bit tricky and I had to do a little trial and error. The first time I tried to cut the fries and bake them, but they got too fluffy. In the end, what worked best was just rolling out a flat sheet and baking it and then cutting the small fry sticks while the dough was still warm. Make sure to sprinkle them with sugar before you bake them, so they have that “salty” look to them! Once you remove them from the over, hurry, as they harden quick and once they do, they will be really hard to cut. I used a large kitchen knife to make quick and sharp lines. *Don’t forget to sprinkle your “fries” with sugar, for a salted effect. I sprinkled mine before baking, but you could probably do either or both. 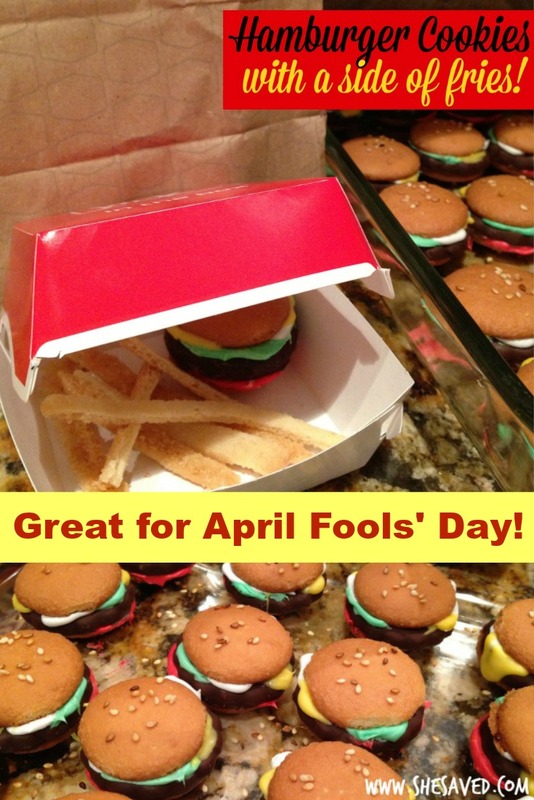 Since we are using this as a classroom birthday party treat for my son ON April Fools’ day, I had the idea to serve it in actually hamburger boxes. The manager at our local Jack in the Box let me purchase 25 small hamburger boxes which was was such a fun touch!! These are precious!! I love all of the little details! Thanks for linking up to the party this week! Oh my goodness, these are adorable! Pinned! These are so cute! Love the sugar cookie fries to go with too. Thank you for sharing at Merry Monday! I love this fun idea! These turned out so cute and any kid would absolutely love them!